Yes, even after my talk about the disdain I have for the title "life artist" I bought this book. 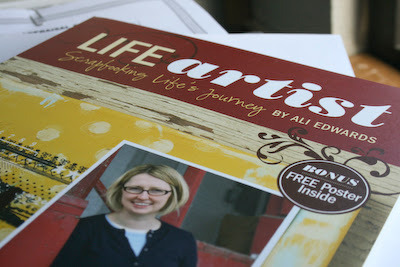 In my opinion, the Ali Edwards books, A Designer's Eye for Scrapbooking with Patterned Paper and A Designer's Eye for Scrapbooking are the two best scrapbooking guides I own. They are filled to the brim with amazing ideas and suggestions. Even 3 1/2 years later, I can go to my original Ali Edwards book and find inspiration. I figured, even though I am not a fan of the whole life artist movement, there would be tons of great layouts for inspiration that I could easily use as inspiration. There are some LOs that are wonderful, like this one. But there are WAY less layouts and way more writing than any of her other books...problem one. The book reads like a self help book guised as a scrapbooking book. If I wanted to figure out Who I Am, I wouldn't buy this book, I'd buy the "Living Life and Loving It" book. The back of the book reads..."Here you'll find hundreds of new ideas to incorporate into your scrapbooking lifestyle." I would NEVER describe my lifestyle as scrapbooking, would you? Maybe I would if I was getting paid to scrap and write books about scrapping. The multitude of pages about "It is OK" just made me want to gag. Again, if I wanted to read "I'm Ok, You're Ok", I woulda bought that book....problem two. And there is WAY too much writing and not enough scrapping in this book. Some of the pictures of the projects are small and the writing just consumes the pages. Way too much reading....problem three. This book, unlike her other books contains projects all done by Ali herself. That may explain for the lack of more projects. It also gives one style of scrapbooking, one way of doing it...her way. Over the years Ali has gotten more "artsy", more "grundgy", more "dirty a scrapbooker than she was before and all the pages are in that style. At least with the other books, she had other talented scrappers work, so the styles varied and anyone could find soemthing in the book that they loved. 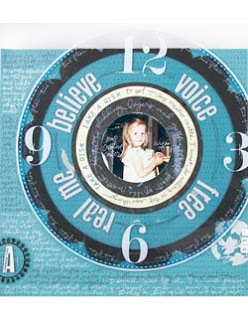 This book is primarily the artistic form of scrapbooking and I have to say not really my style....problem four. Some of this book is like reading some of her blog all over again. I swear I read half of this book before. I think the reason you buy a book is because you can't read it online for free, right? It's just a shame that I have seen these projects and heard a lot of this before but I still paid the $19.95 for this book....problem five. Some of the challenges are great. I don't think she needed all the back story on every challenge and the intense detail to the process, but all in all some of them are good. Some of the layouts are wonderful. I have said that before, but just wanted to reitterate that point. The detailed descriptions and how to on some of the projects is wonderful. I know I use my books many times to scraplift something quick and get back into the flow of it all and this book has a couple projects that are so easy for that. And in the back of the book are some great links. The book itself is gorgeous, the layout, the colors, the fonts...all beautiful. Would I recommend this book? When I think about this, I ask myself, would I tell my bestest scrappin pal to shell out $20 for this baby? Unless you are a die hard life artist or want to get into that lifestyle, this book is not for you. And for the $20 there are other books with plenty more ideas and inspiration out there, like Ali's previous 2 books. If you don't own those....you should! If you want to read it, I will lend it to ya. It's worth a glance and a little read one night in bed but won't be something I refer to on a regular basis for my scrapbooking. Thanks for the wonderful critique. Have you thought about critiquing as a job? You are pretty darn good! A "balanced" review! You gave all the pros and cons....you are so funny! LMAO! "Life artsit", "scrapbooking lifestyle" LOL! I like your critique and agree with you. I have not read the book or even thumbed through it. The title alone was enough to turn me off. And I saw the "webisode" at SIS with her and that was the final "no thank you" for me.